EDUCATIONAL RUBBER DUCK MAKES POTTY TRAINING FUN! 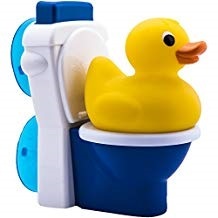 An iconic rubber duck paired with a flushable toy toilet is now available to help parents potty train children through play. Potty Duck™ was developed by a pediatrician to introduce the concepts of pee, potty, and flush. It begins with bath time fun! The toy is safe and easy to clean for ages 18-mos+. Pediatrician Dr. Shelly Mann co-created Potty Duck to help parents introduce playful learning during potty training. The toy will be on display in the New Product Launchpad (Booth 4533), and Dr. Mann will be available to answer any questions.